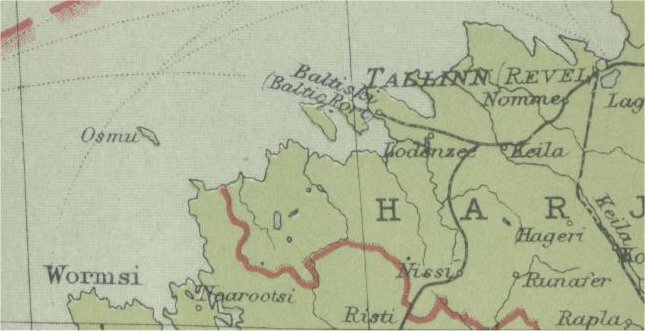 Estonia, part from the map in the Times Atlas 1922. 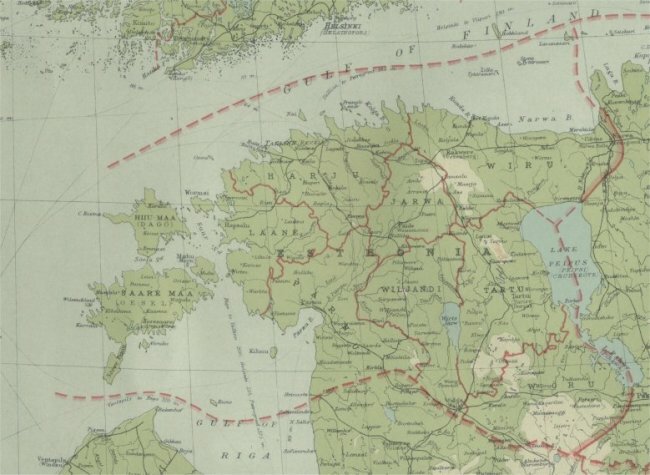 The declaration of independence of Estonia is dated February 14, 1918. November 10, 1918 Jaan Paska, State Minister, commissioned Hindrek Rikkand to set up a management of the post. Also he was commissioned to take over the main post office in Tallinn from the Germans. 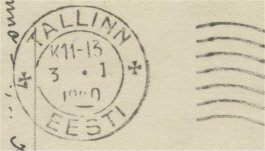 On November 13, 1918, eight older postal workers formed the management of Eesti Post: the start of the Estonian Post. November 19 the main post office was in operation. There were no stamps, but people had of course to paid: this was noted on the item. Old Russian date-stamps were used or provisional rubber stamps. 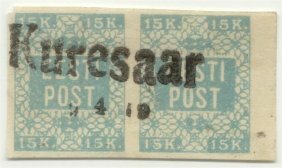 Hindrek Rikkand and Eduard Laaban came on november 18 to Bernhard Mäns Printing house: was it possible to print here the first Estonian postage stamp? The leader of the printing office, Rudolf Zero, convinced them that lithography was more suitable for the printing of postage stamps (instead typography) and composed a little original printing-form fot the first stamp. The conclusion was also that it was better to go to an lithography-printing office for the printing: Georg Böau Reljeef-ja Kivitrükikoda in Nômme. 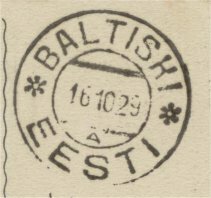 THe first stamps were printed in the period 22-28 November in Nomme and were first sold on subday 24 november in Tallinn and around Tallinn. The sheets: 4 x 100 stamps, lithography, the forerunner of offset printing. Estonia number 1 is a 5 kopek. postage stamp. From July 1, 1926, not longer valid for franking. Total is 1.942.000 postge stamps. 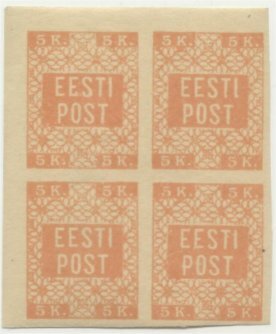 The first postage stamp of Estonia is also forged by Jaan Lubi from Viljandi. 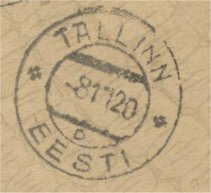 He has produced forgeries of almost all early stamps of Estonia. Erik Sjôgren has described the forgeries of Jaan Lubi. In the Handbook 'EESTI' you can find a good classification of the Estonian cancellations. 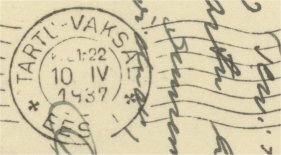 The main types are the provisional cancellations (1918-1920) and the double circle postmarks (1919-1944). Mi. 1 , resized 50 %. Mi. 2 , resized 50 %. 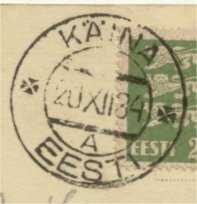 EESTI = Estonia : philately & postal history handbook catalogue = Estland : Philatelie & Postgeschichte Handbuch Katalog / Vambola Hurt, Elmar Ojaste. - 1986 . - 767 p.. - With supplement 1988.